City Paper writer Anna Ditkoff has been chronicling murders in Baltimore City for 7 years. Ditkoff’s words will be read aloud at University of Maryland Francis King Carey School of Law by members of both the Single Carrot Theatre ensemble and the public. Baltimore City’s murder rate has been a constant source of news for decades. Thankfully it’s at its lowest rate in years, but how much do we know about its victims? Putting an age, gender and often a name to the number of homicides in our city is an emotional and important experience. 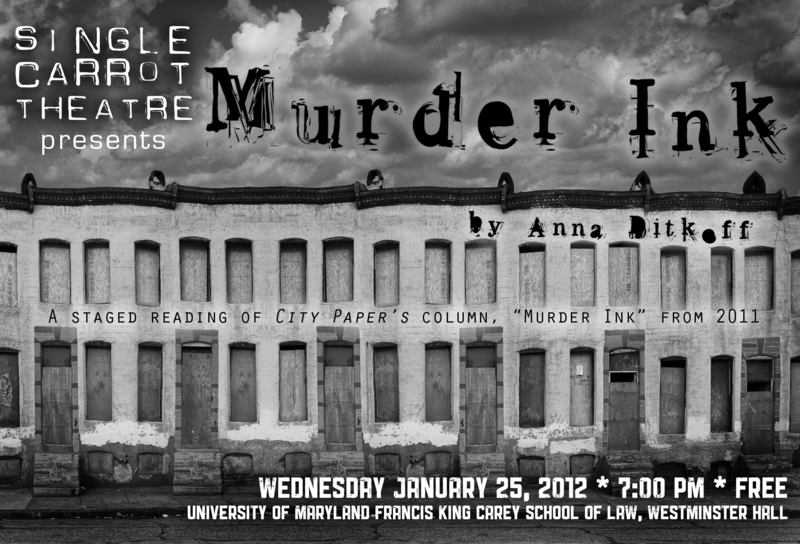 This year, the panel discussion will include “Murder Ink” columnist Anna Ditkoff, Donnie Andrews, Founder and President of Why Murder; and Rebecca Bowman-Rivas, Coordinator of the Law and Social Work Program at the University of Maryland Francis King Carey School of Law. There’s no pretending that reading about these desperate, often grisly crimes will bring back any of the victims, but it does bring a little perspective to what is clearly an epidemic. We hope you’ll join us to listen, remember and reflect.